Readying your home for sale: kitchens and bathrooms are the most important rooms in the house. Make sure your counters, sinks, showers and tubs look bright, modern, clean and well maintained. Renewing dated appearances: does your kitchen or bathroom scream “the seventies” but you don’t want to embrace a major remodel? Refinishing can update colors and style to the current decade, including faux-granite counter top looks. Repairing scratched fixtures: if your sink or bathtub has had years of scratches and chips from abrasive cleaners or general use and abuse, refinishing can give them a brand-new look and make them easier to clean and maintain in the future. Renovating rentals & hotel rooms: replacing older sinks, showers and bathtubs in multiple units can be a costly and time-consuming project; refinishing is a more sensible alternative for the business budget. 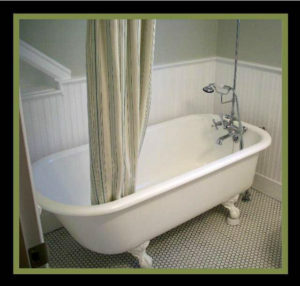 Advanced Refinishing is owner-operated by Kirk “The Tub Guy” Canfield, who has substantial experience in the bathtub refinishing industry. You can count on professional, courteous, honest and knowledgeable service when dealing directly with the business owner. Distributor of Strom Plumbing by Sign of the Crab vintage reproduction bath fixtures. Click to verify Better Business Bureau A+ Rating and to see a BBB report. Theme by Out the Box. Copyright 2007-2019 Advanced Refinishing LLC. No content or images maybe reproduced from this site.